Every tourist who arrives in Moldavia must absolutely see the monasteries. And if they get hungry, beyond the traditional ciorba (traditional minestrone) and sarmale (cabbage rolls stuffed with minced meat and rice), the best choice is the traditional Moldavian dessert. We speak of “poale-n brâu", also known as brânzoaice, a finger-licking good. This gourmet meal is made with seven traditional ingredients, namely, flour, sugar, salt, milk, oil, eggs and cheese. Therefore, the "poale-n brâu" are also very healthy. These tasty cakes are delicious and very easy to prepare and their taste is very special. The name has its origin in the country life and goes back to ancient times. "This name comes from the women wearing the "catrinţă" a skirt-shaped apron and, to be more comfortable in their movements when washing or doing other work, they raised a corner of the skirt and attached it to the waist - brâu -. Hence the name of "poale-n brâu", said Florentina Buzenschi to Agerpres, director of the Ethnographic Museum of Neamt county. In the past, these were the Moldavian traditional pies stuffed with sheep's cheese, which was sweetened with sugar. In addition, the housewives who lived in the villages of Moldova not used to cook cakes or pies, but only for special events or holidays. 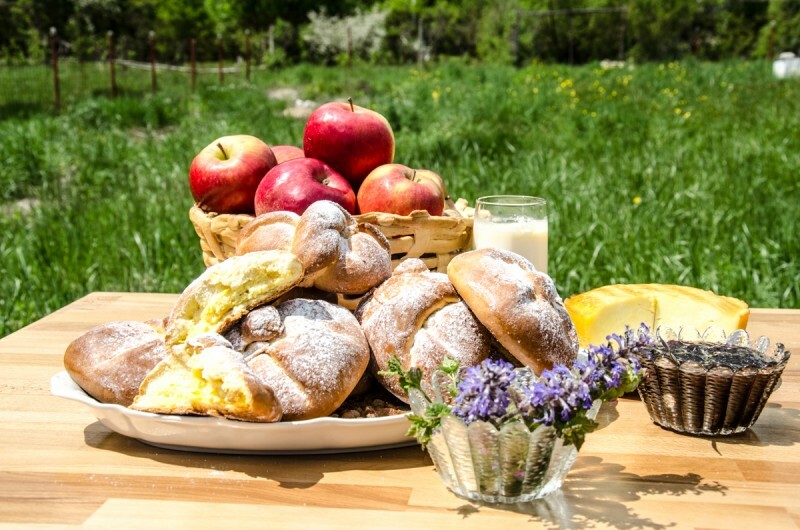 According to tradition, the "poale-n brâu" were offered as alms before starting Lent or for “Moșii de Iarnă”. Whenever you wish to prepare the "poale-n brâu" to convince yourself how delicious and easy they are to prepare, you should know that for the mixture of 12 cakes you need the following ingredients: 500 grams of flour, two eggs, 200 ml of warm milk, 30 g of yeast, a tablespoon of sugar and two tablespoons of oil, has revealed to Agerpres, a housewife of Moldavia. For the filling takes about 300 grams of cheese, preferably fresh cow cheese, two eggs, four tablespoons of sugar and a half teaspoon of salt. In addition, after being placed in the baking tray, cakes are smeared with egg yolk mixed with a tablespoon of sugar.